Spending time with good friends from our days at Miami University has been a fantastic experience of firsts. First trip to Maine. First time lobstering. First effort to catch a striper on fly. We stayed with great lifelong friends, Pete and Margy Cowgill along with Sigma Nu and Ohio friends, Terry and Linda Wright. The Cowgill’s stunning new home overlooks Peter’s Coves outside of Harpswell, Maine. On Sunday, we were joined by Doug Starrett and his wife, Clare. So the gathered Sigma Nus had nicknames of Mush, Boat, Dr. Feelgood, and Smiler. I will let the reader ponder those match ups. We followed him to the lobster live well which contained about fifty lobsters swimming freely in a 10 by 10 aerated salt water bath. Toby reached in a small trap and said, “these are 1 in 2 million”, as he pulled out a blue lobster. Blue lobster have a mutant gene which causes them to secrete excess protein which results in the blue shell. 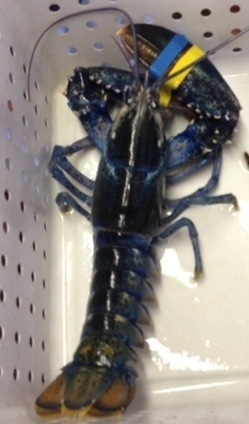 This lobster was a far more brilliant blue than the photo shows. Imagine the wonder of it! First day ever in Maine and we see a blue lobster. The lobster rarity foreshadowed a fantastic weekend with long cherished friends! This entry was posted in Fishing Stories and tagged Lobster, Maine, Peter Cowgill, Sigma Nu, Terry Wright by Tarpon Slam. Bookmark the permalink. Great blog, Boat! You bring it back to life!